2.Are There Any Casinos in Wyoming? 3.Is Horse Racing Permitted in WY? 5.What are the Online Poker Laws in the State of Wyoming? 5.1Is it Legal to Play Poker in Wyoming? 5.2Will Wyoming Regulate Online Poker? 8.What is Wyoming's Gambling History? Wyoming is not what you'd call a "gambling friendly" state. There are some opportunities to place some legal wagers here and there, but gamblers have had to fight for every inch and it hasn't been an easy road. Even on the back of a federal law granting tribes the right to open casinos on tribal land, the state of Wyoming tried to resist and the back and forth was far from pretty. No, the Cowboy State has other things – like wide open spaces and rodeos – on its mind and gambling is firmly relegated to the back burner. But hey – don't start thinking that gamblers are totally out of luck! Tribal casinos did eventually launch and now you can find everything from slot machines to live poker if you know where to look. We've got the inside track on everything from pari-mutuel betting to bingo and a bit of history, too! First we will cover the definitions of gambling1 and move on to the various of legal forms including tribal casinos, racinos, horse racing and poker. The following definitions are important for you to understand. "risking any property for gain contingent in whole or in part upon lot, chance, the operation of a gambling device or the happening or outcome of an event, including a sporting event, over which the person taking a risk has no control"
"any device, machine, paraphernalia or equipment except an antique gambling device that is used or usable in the playing phases of any professional gambling activity, whether that activity consists of gambling between persons or gambling by a person involving the playing of a machine"
"any building, room, enclosure, vehicle, vessel or other place, whether open or enclosed, used or intended to be used for professional gambling. Any place where a gambling device is found is presumed to be intended to be used for professional gambling"
These definitions become increasingly important as the state attempts to address new forms of gambling (online poker, for instance), but more on that a bit later. Are There Any Casinos In Wyoming? There are no commercial casinos in Wyoming, however there are currently three tribal casinos in the state, each of which offers the standard array of class 3 casino games including blackjack, roulette, and poker as well as hundreds of slot games ranging from video poker to classic reels. Slot wages range from just a penny to a whopping $25 per hand and some machines feature progressive jackpots. There are also dedicated poker rooms and poker and slot tournaments at some locations. Depending on the casino, you can also find a variety of dining options, adjacent hotel accommodations, and a docket of special events such as concerts, car shows, and Native American gatherings. These tribal casinos were hard-won victories for local tribes; despite the existence of the Federal Indian Gaming Regulatory Act, which passed in 1988 2, state officials still fought against granting any compacts. The tribes ultimately had to take the state to court and it took more than a decade to finally receive the compacts they were legally owed. Is Horse Racing Permitted in WY? You can place wagers on horse races in Wyoming as long as you do so via a licensed location that uses the pari-mutuel system. This system pools all of the bets on a certain race and allows the house to take its cut before the remaining funds are divided up between bettors holding winning tickets. Currently, the only race track hosting horse races is Wyoming Downs, which is open from June 24 through August 13. There are also a number of off-track/simulcast betting locations in the state. Some locations allow patrons 18 years of age and older to place bets while other locations have set the minimum age to 21. All of these regulations are overseen by the Wyoming Pari-Mutuel Commission3. Wyoming also has electronic betting kiosks which allow people to bet on previously run races based on a small amount of information that's doled out prior to the launch of the "rebroadcast" of the event. It's illegal to bet on dog racing. The Wyoming Lottery Corporation, more commonly billed as "WyoLotto", is sold by retailers state wide. Participants must be at least 18 years of age in order to buy tickets for both in-state and Multi-State Lottery Association (MUSL) games. The first $6 million in revenue generated by in-state ticket sales for games such as Cowboy Draw is funneled through the state treasury and then used at the city, town, and county level for various projects. Any money raised in excess of that $6 million benchmark goes to fund education throughout the state. Wyoming does not currently allow scratch-off tickets and instant win games and video lottery terminals are also banned. Charitable gaming is limited to bingo games, raffles, and "casino night" events. There are some requirements that each nonprofit has to meet before it can legally host a charitable game, however: the nonprofit must have been in existence for at least three years before applying to run a game and at least 65% of the monthly event sales must be returned as winnings. Social gaming in Wyoming is allowed, albeit with some restrictions. Home games must only involve players who have a previous social relationship – that pretty much means friends, family, and coworkers – and the host cannot "rake" the game or otherwise make a profit like by charging an entry fee. 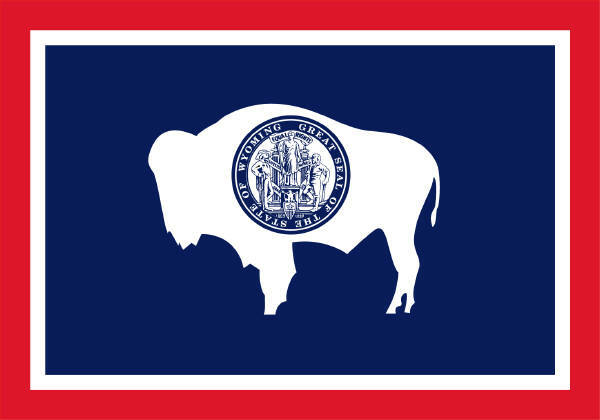 What are the Online Poker Laws in the State of Wyoming? Wyoming currently has no laws on the books that specifically outlaw internet gambling, but, as is the case in many states, the powers that be believe that current gambling laws are enough to prohibit games such as online poker. The state's legal definition of poker refers to "risking any property for gain contingent in whole or in part upon lot, chance, the operation of a gambling device or the happening or outcome of an event, including a sporting event, over which the person taking a risk has no control" and an ambitious or particularly zealous prosecutor could choose to apply that statute to internet-based wagers as well. Of course, this is mostly theoretical. Wyoming doesn't seem too interested in chasing down online poker players who enjoy the occasional game of Texas Hold 'Em from the comfort of their own home, however we'd definitely recommend against operating a commercial site or otherwise trying to run online poker games for profit. Keep a low profile and use one of the many off-shore gambling sites currently available – they'll be happy to help you set up an account and you can be playing in mere minutes. Any other legal questions regarding risks related to online poker in Wyoming should be directed towards a local lawyer who specializes in gambling law. Is it Legal to Play Poker in Wyoming? You can legally play poker at one of Wyoming's tribal casinos, where live table play is on offer as well as periodic tournaments – some of which have some fairly nice payouts. You can also play social games in Wyoming assuming the participants know each other previously (no inviting strangers over for a more commercialized game) and the host doesn't seek to make a profit by running the game. Will Wyoming Regulate Online Poker? Wyoming has proven itself to be very rigid when it comes to gambling. Each small legislative step forward has come only as the result of dragged out negotiations and a ton of resistance4. Even tribal compacts, which were allowed under federal law, were initially refused by state officials and it took a 10-year legal battle to right that wrong. Given that pattern of behavior and overall attitude, it's hard to see how online poker could be legalized in Wyoming any time soon. For that to happen, there would have to be a huge shift in public opinion and some hefty financial incentives. Wyoming also has a relatively small population so a multi-state agreement that would pool players and other resources would also be helpful. For now, though, that's just a pipe dream. Watch for many other states to take initiative before Wyoming even starts to step up. What is Wyoming's Gambling History? In 1967, the state legalized pari-mutuel wagering and put the Wyoming Pari-Mutuel Commission in charge of all race-related betting. Racing died out in 2010 but after "historic horse racing" was added to the list of permitted pari-mutuel activities in 2013, interest regenerated and live racing started up again the following year. When the federal government passed the Indian Gaming Regulatory Act in 1988, several of Wyoming's tribes looked to negotiate their own compacts so they could open the casinos they were allowed under the new law. Wyoming refused to even enter negotiations and the tribes were forced to sue. In 2005, they finally won their case (at the federal level) and in 2006 both the Eastern Shoshone and Northern Arapaho tribes received their compacts. As of this writing, those two tribes are still the only ones with compacts and they run Wyoming's three tribal casinos. Wyoming only recently launched its lottery in July 2013 after Governor Matt Mead signed House Bill 775 authorization the creation of a new state lottery. 1 - 2011 Wyoming Statutes TITLE 6 - CRIMES AND OFFENSES CHAPTER 7 - 101. Definitions.